Russia–Turkey relations (Russian: Российско–турецкие отношения; Turkish: Rusya–Türkiye ilişkileri) is the bilateral relationship between the Russian Federation and the Republic of Turkey and their predecessor states. Relations between the two are rather cyclical. From the late 16th until the early 20th centuries, relations between the Ottoman and Russian empires were normally adverse and hostile and the two powers were engaged in a large number of Russo-Turkish wars, one of the longest wars in modern history. However, in the early 1920s, as a result of the Bolshevik Russian government′s assistance to Turkish revolutionaries during the Turkish War of Independence, the governments of Moscow and Ankara developed warm relations. Relations turned sour at the end of WWII as the Soviet government laid territorial claims and demanded other concession from Turkey. Turkey joined NATO in 1952 and placed itself within the Western alliance against the Warsaw Pact during the Cold War, when relations between the two countries were at their lowest level. Following the dissolution of the Soviet Union in 1991, relations between Turkey and Russia improved significantly and the two countries came to rank among each other's largest trade partners. Russia became Turkey's largest provider of energy, while many Turkish companies began to operate in Russia. In the 1990s, Turkey became the top foreign destination for Russian tourists. However, both countries still stand on opposite ends when it comes to foreign policy, especially in tense issues such as the Nagorno-Karabakh conflict, Syrian Civil War, the Kosovo conflict and have opposing views on the Armenian genocide. Relations were tense following the Russian fighter jet shootdown in November 2015 to get normalised again in 2017. Russian Consulate (until 1923 the Russian Embassy) on İstiklal Avenue in Beyoğlu (Pera), Istanbul, 2011. Russian Embassy in Ankara, 2015. Slavic and Turkic peoples have been in contact for thousands of years along the Eurasian Steppe. Medieval Turkic kingdoms like Khazaria, Cumania, Volga Bulgaria, the Kipchak Khanate, the Khanate of Kazan, the Crimean Khanate, the Astrakhan Khanate and the Khanate of Sibir were established in parts of present-day Russia, with a continuing demographic, genetic, linguistic and cultural legacy. The Turks in Anatolia were separated from Russia by the Black Sea and the Polish-Lithuanian Commonwealth to the northwest and the Caucasus mountains to the east. The Turks founded the Ottoman Empire in Anatolia and began expanding outwards, while Russia was doing the same. The two empires began a series of clashes over the Black Sea basin. The collapse of Constantinople in 1453 to the Ottomans marked the end of the Christian Byzantine Empire, and Russia became the seat of the Eastern Orthodox Church and its rulers inherited the Byzantine legacy. Punch cartoon from 17 June 1876. 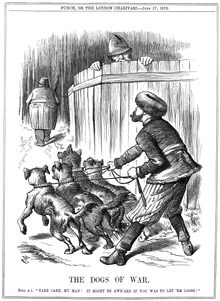 The Russian Empire preparing to let slip the Balkan "Dogs of War" to attack the Ottoman Empire, while policeman John Bull (UK) warns Russia to take care. Supported by Russia, Serbia and Montenegro declared war on the Ottoman Empire the next day. These clashes eventually triggered the Russo-Turkish War of 1877–1878. Starting in 1549, the Ottoman Empire's support for smaller Turkic and Islamic vassal states in modern Russia (the Astrakhan Khanate, the Crimean Khanate, etc.) brought the two empires into conflict. The Black Sea was under Ottoman control when the Russians began their offensive against the Turks. In 1696 Peter the Great took Azov, but many more battles lay ahead. The Russo-Turkish War (1768-74) resulted in the Treaty of Küçük Kaynarca in 1774. This treaty granted Russia passage to the Black Sea, making it possible for Russia to gain access to the Mediterranean Sea. It also allowed the Russians the privilege to intervene in the Ottoman Empire on the behalf of the Eastern Orthodox Christian populations. By the 19th century, Russia was helping Turkey's Slavic and Christian minorities to revolt against Ottoman rule. Russia did not always have in mind the goal of partitioning the Ottoman state, fearing this would aid the expansion plans of the Austrian Empire in the Balkan peninsula, which was largely Orthodox. Eventually, however, the desire for free passage through the Turkish Straits and Pan-Slavist feeling at home pushed Russia in that direction, leading to the decisive intervention in 1877–78. The two empires fought each other for the last time during World War I. However, by the end of the war both monarchies had been either overthrown or defeated. The Republic Monument (1928) at Taksim Square in Istanbul, crafted by Pietro Canonica. The people standing behind Mustafa Kemal Atatürk, founder of the Turkish Republic, include Semyon Ivanovich Aralov, Ambassador of the Russian SFSR in Ankara during the Turkish War of Independence (1919–1922). His presence in the monument, ordered by Atatürk, points out to the financial and military aid sent by Vladimir Lenin in 1920, during the war. The Ottoman government was party to the Treaty of Brest-Litovsk signed between the bolshevik government of Russia and the Central Powers on March 3, 1918; the treaty became obsolete later the same year. Russian bolsheviks and the Soviet government headed by Vladimir Lenin, who emerged victorious from the Russian Civil War by 1921, viewed the Turkish revolutionary (national) movement under the leadership of Mustafa Kemal as friendly, and Lenin's government abdicated the traditional claims of the Russian Empire to the territories of Western Armenia and the Straits. The Soviet supply of gold and armaments to the Kemalists in 1920–1922 was a key factor in the latter's successful power grab in an Ottoman Empire defeated by the Triple Entente and their victory in the Armenian campaign and the Greco-Turkish War (1919–22). Ottoman postcard of the Russian Embassy's summer residence in the Büyükdere neighbourhood of Istanbul, on the Bosphorus. The main building of the Russian Embassy (since 1923 the Russian Consulate) is on İstiklal Avenue in the Beyoğlu (Pera) district. The Russian Soviet Federative Socialist Republic was the second state to formally recognize the Kemalist government of Turkey with the Treaty of Moscow signed on 16 March 1921 between the RSFSR's Lenin government and the government of the Grand National Assembly of Turkey (the Sultanate was still nominally in existence). Under the Treaty of Moscow, the two governments undertook to establish friendly relations between the countries; Article VI of the Treaty declared all the treaties theretofore concluded between Russia and Turkey to be null and void. The Treaty of Moscow was followed by an identical Treaty of Kars signed in October 1921 by the Kemalists with Soviet Armenia, Soviet Azerbaijan and Soviet Georgia, which formed part of the Soviet Union after the December 1922 Union Treaty. After being exiled from the Soviet Union in February 1929, Leon Trotsky arrived in Istanbul and lived for nearly 4 years (1929–1933) at a house in Büyükada Island, the largest of the Prince Islands in the Sea of Marmara, to the southeast of Istanbul. The house inhabited by Leon Trotsky (1929–1933) in Büyükada Island near Istanbul. The first serious tensions in the countries' bilateral relations emerged during the negotiations that led to the signing of the Montreux Convention in July 1936, when Turkey regained control over the Straits which it was allowed to remilitarize. Soviet stamp of Turkish poet Nâzım Hikmet, who died in Moscow and was buried at the Novodevichy Cemetery. While Turkey officially remained neutral during World War II until 23 February 1945, the USSR viewed Turkey's continued relationship with Germany, whose warships were allowed passage through the Straits, as inimical to itself. On 19 March 1945, the USSR's Foreign Minister Molotov advised Turkey's ambassador in Moscow that the USSR was unilaterally withdrawing from the 1925 Non-Aggression pact; the decision was explained by asserting that "due to the deep changes that had occurred especially during World War II" the treaty did not cohere with "the new situation and needed serious improvement." The Turkish government was subsequently informed by Molotov that in addition to bases in the Straits, the Soviet Union also claimed a part of eastern Turkey, which was assumed to refer to the districts of Kars, Artvin and Ardahan, which the Russian Empire (and the short-lived Democratic Republic of Armenia) had held between 1878 and 1921. At the Potsdam Conference (July 1945), Soviet Premier Joseph Stalin demanded a revision of the Montreux Convention; the Soviet demand that the USSR should be allowed to join in the defence of the Straits was rejected by Turkey, with the backing of the West. In March 1947, with the proclamation of the Truman Doctrine, the US underwrote the frontiers of Turkey (as well as Greece) and the continued existence of non-communist governments in the two countries. Turkey sought aid from the United States and joined NATO in 1952. The USSR and Turkey were in different camps during the Korean War and throughout the Cold War. Following the dissolution of the Soviet Union, relations between the two nations improved; on May 25, 1992, a visit to Moscow by Turkish Prime Minister Süleyman Demirel saw the signing of a Russian-Turkish treaty. Although disagreements regarding the border dispute over the Caucasus and support of each other's lifelong historical adversaries both linger. Russia is somewhat skeptical of Turkey's admission into the European Union which has the potential of damaging its relations with Turkey, but both countries are key strategic partners in the Transcaucasian region. In May 2010, the visit by the Russian President Medvedev to Turkey saw the signing of numerous deals such as the lifting of visa requirements. A multibillion-dollar deal was signed for the construction of a nuclear power plant in Akkuyu, Mersin. According to a November 2018 INR poll, 51% of Turks view Russia favourably and 43 percent view it unfavourably. Russian President Vladimir Putin and Turkish President Recep Tayyip Erdoğan in a meeting in Istanbul, 3 December 2012. On 24 November 2015, within weeks of the start of the Russian military intervention in support of Syria′s President Bashar al-Assad, Turkish F-16 combat aircraft shot down a Russian Su-24 during an airspace dispute close to the Turkish-Syrian border. Russian President Vladimir Putin described the incident as "a stab in the back by the accomplices of terrorists" and further stated that "today's tragic events will have significant consequences including for relations between Russia and Turkey". In response, Russia imposed a number of economic sanctions on Turkey. These included the suspension of visa-free travel to Russia for Turkish citizens, limits on Turkish residents and companies doing business in Russia and restrictions on imports of Turkish products. Russian tour operators were discouraged from selling Turkish package holidays and asked to stop charter flights to Turkey while Russian football clubs were banned from signing Turkish players and discouraged from organizing winter training camps in Turkey. The day after the jet was shot down, a Russian law-maker, Sergei Mironov, introduced a bill to the Russian parliament that would criminalize the denial of the Armenian Genocide, a political move that Turkey has strongly opposed when countries like France and Greece adopted similar laws. The Pan-Orthodox Council, which had been originally scheduled to be held in Istanbul′s Hagia Irene in 2016 had to be shifted to Crete, Greece, after the Russian Orthodox Church indicated that it did not want to go to Turkey due to the crisis between the two countries following the downing of the Russian jet. The process of normalisation of ties between the two countries was started in June 2016 with Recep Erdoğan expressing regret to Putin for the downing of the Russian warplane. Putin and Erdogan held a telephonic conversation on 29 June which was described as being productive by Russian and Turkish government officials. The Russian government later lifted the travel restrictions on Russian citizens visiting Turkey and ordered normalisation of trade ties. On 9 August 2016, the countries′ leaders held a meeting in St Petersburg, Russia, which was described by a commentator as a ″clear-the-air summit″ — the first time the pair met since they fallout over the Russian fighter jet downing by the Turkish air force as well as Erdoğan’s first trip abroad since the failed coup attempt in Turkey. The BBC commented that the summit, at which Erdoğan thanked Putin for his swift support during the coup attempt, ″unnerved the West″. Following the assassination of Russian ambassador to Turkey Andrei Karlov on 19 December 2016, the countries′ leaders sought to contain any possible damage to relations between the two countries. In December 2016, the two countries initiated the Astana peace talks on Syria peace settlement, subsequently, along with Iran, agreeing to create de-escalation zones in Syria. On 31 May 2017, Russia lifted most of the sanctions it had imposed on Turkey, which includes lifted restrictions on Turkish companies operating in Russia and ended a ban on employing Turkish workers in the country. It also ended an embargo on a range of Turkish imports. President Putin also restored a bilateral agreement on visa-free movement between the two countries. During Putin′s visit to Ankara at the end of September 2017, the Turkish and Russian presidents said they agreed to closely cooperate on ending Syria’s civil war. Vladimir Putin′s visit to Ankara in December that year was the third face-to-face meeting between the countries′ leaders in less than a month and their seventh in a year. On 12 September 2017, Turkey announced that it had signed a deal to purchase the Russian S-400 surface-to-air missile system; the deal was characterised by American press as ″the clearest sign of [Recep Erdoğan]′s pivot toward Russia and away from NATO and the West" that ″cements a recent rapprochement with Russia″. Despite pressure to cancel the deal on the part of the Trump administration, in April 2018 the scheduled delivery of the S-400 batteries had been brought forward from the first quarter of 2020 to July 2019. In June 2018, the Russian government-controlled news agency Sputnik, shut down its website in Kurdish language without mentioning any particular reason for the decision. Former employees of Sputnik said that the news agency decided to shut it down at Turkey’s request. In mid-August 2018, Russia and Turkey backed one another in their respective disputes with the United States. Russia condemned U.S. sanctions against Turkey over the detention of Andrew Brunson, while Turkey stated its opposition to U.S. sanctions on Russia over the annexation of Crimea and alleged interference in the 2016 U.S. elections. Despite these high ties, Turkish foreign minister Mevlüt Çavuşoğlu stated that Turkey was not going to have to choose between Russia and the United States. ^ Ziring, Lawrence (1981). Iran, Turkey, and Afghanistan, A Political Chronology. United States: Praeger Publishers. ISBN 0-03-058651-8. ^ a b İmren Arbaç. "Symbol Figure in Russian-Turkish Rapprochement in Taksim Republic Monument". Yeditepe University. ^ Документы внешней политики СССР. Moscow, 1959, Vol. III, pp. 597-604. ^ Mango, Andrew. Turkey. Thames and Hudson, London, 1968, p. 63. ^ a b БСЭ, 1st ed., Moscow, Vol. 55 (1947), col. 381. ^ БСЭ, 1st ed., Moscow, Vol. 55 (1947), col. 382. ^ Внешняя политка Советского Союза в период Отечественной войны. ОГИЗ, 1947, Vol. III, p. 146. ^ a b c Mango, Andrew. Turkey. Thames and Hudson, London, 1968, p. 69. ^ "Erdoğan to visit Russia next month, report says". Today’s Zaman. 2009-04-25. ^ "Erdoğan seeks Russian backing in Karabakh peace effort". Today’s Zaman. 2009-05-16. ^ "Putin to visit Turkey next month". Today’s Zaman. 2009-05-20. ^ "Turkey shoots down Russian warplane on Syria border". 2015-11-24. Retrieved 2015-11-24. ^ "Russian deputies seek accountability for Armenia genocide denial". Reuters. 2015-11-25. Retrieved 2015-12-07. ^ "Greece: Third Country to Criminalize Denial of the Armenian Genocide". Asbarez.com. Retrieved 2015-12-07. ^ "Orthodox Council moved from Turkey to Greece over Russia crisis". Hürriyet Daily News. 19 April 2016. ^ Last-minute politics overshadow historic pan-Orthodox council. The Washington Post, 18 December 2015. ^ Cобрание Патриархов в Стамбуле Nezavisimaya Gazeta, 30 December 2014. ^ "Erdoğan has apologised for downing of Russian jet, Kremlin says". The Guardian. 2016-06-27. Retrieved 2016-07-14. ^ "Russia closes 'crisis chapter' with Turkey". Al Jazeera. 2016-06-29. Retrieved 2016-07-14. ^ "Erdoğan and Putin discuss closer ties in first meeting since jet downing: Turkish president holds talks in St Petersburg with Russian counterpart, thanking him for support in wake of last month's coup attempt". The Guardian. 9 August 2016. ^ Turkey's Erdogan unnerves West with Putin visit BBC, 9 August 2016. ^ "Why killing of Russian diplomat may well bring Turkey and Russia closer: Putin and Erdoğan are likely to find common ground in their desire to blame third parties for death of Andrei Karlov". The Guardian. 19 December 2016. ^ "Russian president guarantees envoy's murder won't damage Russia-Turkey ties". Hürriyet Daily News. 23 December 2016. ^ Переговоры в Астане по урегулированию конфликта в Сирии RIA Novosti, 3 May 2017. ^ Hille, Kathrin (1 June 2017). "Russia lifts most sanctions imposed on Turkey after downing of jet". Financial Times. ^ Putin, Erdogan Pledge To Closely Cooperate On Syria, Increase Trade Radio Liberty, 29 September 2017. ^ Russian-Turkish talks kremlin.ru, 11 December 2017. ^ Turkey Signs Russian Missile Deal, Pivoting From NATO. The New York Times (Europe), 12 September 2017. ^ Turkey will reportedly start getting Russia's advanced missile defense system in 2019, despite US efforts to block it Business Insider, 21 August 2018. ^ Russia's Lavrov, in Turkey, calls U.S. sanctions policy illegitimate Reuters, 14 August 2018. ^ Turkey never supported anti-Russian sanctions — top diplomat TASS, 14 August 2018. ^ Turkey Shifts Toward Russia as Sanctions Sour U.S. Relations: Foreign ministers slam Western sanctions, as Erdogan plans boycott of U.S. electronic goods WSJ, 14 August 2018. Armour, Ian D. (2007). A History of Eastern Europe 1740-1918. Hodder Arnold. ISBN 0-340-76040-0. Aktürk, Şener (September 2006). "Turkish-Russian Relations after the Cold War (1992-2002)". Turkish Studies. 7 (3): 337–364. doi:10.1080/14683840600891034. Wikimedia Commons has media related to Relations of Russia and Turkey.